I have made a discovery when it comes to smoothies: The right combination of fruit can make a huge difference. I have found that pairing a strong, tart flavored fruit with a mild and sweet fruit makes a winning combination. Take for example blueberry. I personally find a smoothie with just blueberries “dull” tasting. However, adding a bit of orange juice or a whole orange makes the flavors “pop”. Frozen strawberries can be bold and tart, but combining them with a mild and sweet banana is a classic combination. The same applies with this raspberry pear smoothie. Pears are sweet and mild while raspberries are tart and in-your-face. 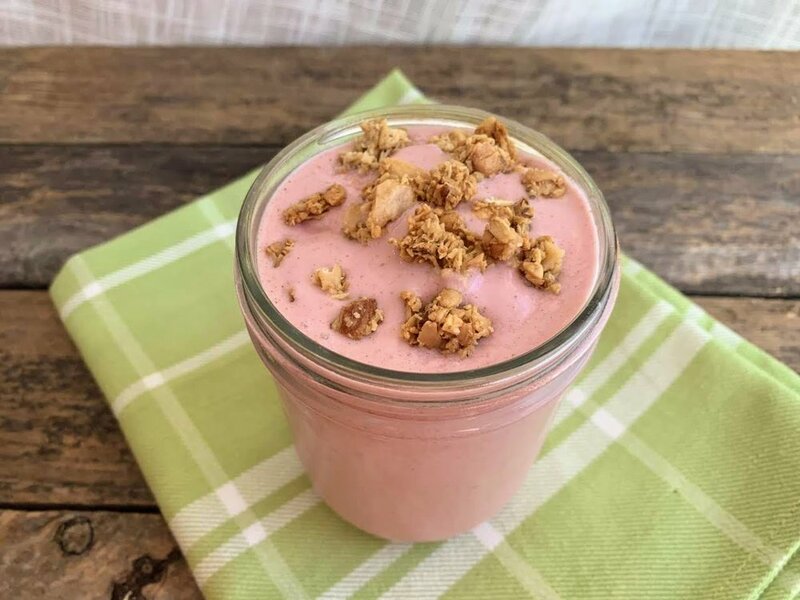 The almond flavor adds interest, making this a unique and exciting smoothie. Let me know if you agree! To get the recipe for this customizable granola with crispy clusters, go here. Blend until smooth. Makes 2 servings. I wanted to create a super-simple, family-friendly recipe using parsnips, so I came up with this soup. After the work of cutting the vegetables is done, it is pretty much hands-off. Cut up your vegetables like so and place in a pot to simmer. Place all the ingredients except cream in a large pot. Cover and simmer for about 20 minutes, until the vegetables are fork tender. After ladling the soup into bowls, pour 2 T. cream over the top of each bowl and gently swirl it in. Top with grated cheese and minced parsley. It’s also good with a dollop of sour cream or herb pesto. Yields about 4 1/2 cups soup. 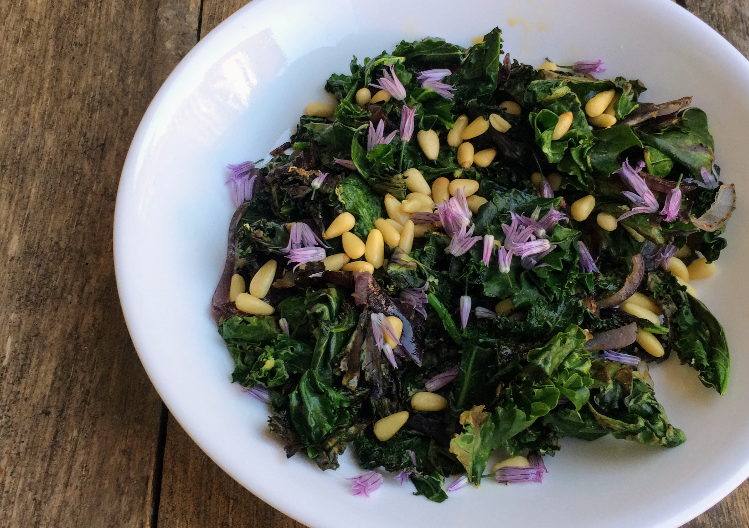 Sauteed kale with purple onions and carrot ribbons (made using a vegetable peeler) and garnished with pine nuts. Wash the greens, then tear or cut into 1" pieces. Add the onions, greens, and carrot ribbons (if using) to the skillet. Cook for several minutes, flipping occasionally. If you would like to retain some of the moisture in the greens, you can cover the skillet with a lid to trap the steam. When the greens are tender and reduced in volume (but still green bright green), remove from the heat and add the seasonings: salt and pepper, ginger, coconut aminos, pine nuts and/or parmesan. This is one of my favorite recipes to make EVER. I am a beans and veggies kind of girl all the way, so it's no wonder this recipe if one of my favorites. This recipe was originally supposed to have tortillas pieces stirred into it, but since we are currently grain-free/gluten-free, we leave those out. For those of you who are cooking for a "where's-the-beef?" kind of husband, you may want to add some pre-cooked cut-up chicken or beef. Adapt this recipe to fit your needs! Mix the first 1/2 T. oil with the cubed butternut and roast in the oven at 400 for 30 minutes or until tender but not mushy. While the butternut is roasting, get out a skillet and prepare the rest of the dish. Saute the onions and peppers in 1 T. oil until tender. Add the minced garlic and saute briefly. Add the chili, cumin, and paprika, and flour and cook briefly until fragrant. Add the broth and simmer until thickened. Stir in the black beans, salt, and roasted butternut. Cook a little bit longer. Top with cheddar cheese, minced cilantro, tomatoes, and sour cream. Peel the eggplant and cut into 1/2 inch cubes. Toss with 1/2 T. oil and 1/4 tsp salt. Spread in a single layer on a baking sheet or cast iron pan. Roast until tender and browned, about 20 minutes (flip the eggplant halfway through to cook evenly). Bring a pot of water to a boil and cook the pasta until done. Heat 1/2 T. oil in a pot. Add onions and saute until golden and tender. Add the garlic, thyme, and sage, and saute briefly until fragrant. Add the pureed winter squash, chicken stock, milk, salt, and pepper and cook until thick and bubbly. When the eggplant and pasta are done, add them to the pot with the sauce and heat through. Top with cheese and enjoy! If you've never had parsnips before, this would be a great recipe to try them for the first time. I asked my family what they though of these and they said the parsnips tasted like a cross between a baked potato and a steamed carrot. So there you go- parsnips are nothing weird! Cut the carrots into 1/4 inch slices and toss with the melted butter. Place in a glass dish with the sliced onions. Sprinkle with salt. Cover the dish (either with a glass lid or tinfoil). Bake for 30 minutes, or until fork tender. Pssst- low-carbers: You could mash these parsnips and they would be faux-mashed-potatoes! I am almost embarrassed to post this recipe- it's so simple. But sometimes simple is SO GOOD. Need a quick vegetable side for a meal? This can be thrown together in about 10 minutes. Note: You can use any kind of peppers you like- small or large, sweet or hot. 1. Cut up some peppers and onions in about 1/4 thick slices. 2. Heat a little bit of oil in a skillet. 3. Saute the peppers and onions for a few minutes until brown around the edges.